The search for the perfect cup of iced coffee has been plaguing some coffee lovers for some time now. 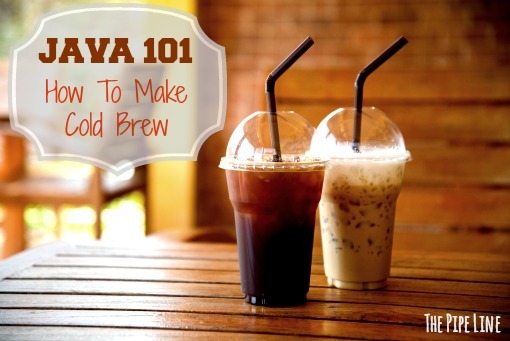 That’s because when you go to your local coffee house and order an iced coffee, you usually get one of two things – hot coffee that’s poured over ice or hot coffee that’s been chilled after its brewed. One of them results in a watered down cup o’ Joe, and the other is only slightly better in terms of taste. But, for the most part, some might agree that iced coffee prepared from hot coffee leads to a slightly bitter tasting brew. Cold brew isn’t iced coffee because iced coffee is prepared from hot coffee as described above. Instead, cold brewing is a process that involves steeping coffee grounds at room temperature for an extended period of time. This results in a noticeably smoother tasting coffee because it has a lower acidity than traditionally brewed coffee. Plenty of coffee houses and companies are currently selling their own pre-prepared cold brew and espresso aficionados have been buzzing about this process and its growing popularity. But don’t think you need to dig deep into your wallet and buy your cold brew from that conglomerate coffee company that’s on every corner or that trendy Brooklyn-based coffee house where everyone behind the counter wears flannel and thinks they’re smarter than you are. 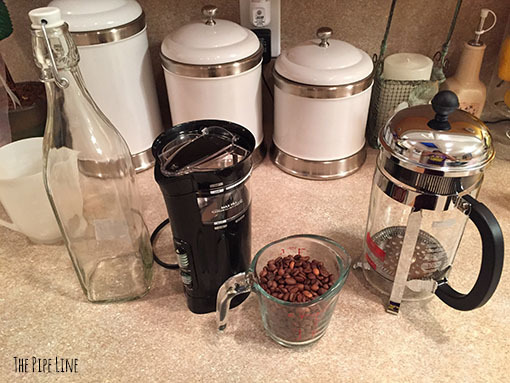 In fact, if you have your favorite whole coffee beans, a grinder and a French press, you could be making your own in no time…er, scratch that, but you can make your own! The result is a cold brew concentrate that you can keep in a separate container in the refrigerator for a couple of weeks. Grind the beans coarsely. Coffee beans that are ground for regular brewing are too fine for this method and will make the batch of brew taste bitter. So set your coffee grinder to coarse! Wait. Let the coffee infuse for 12 hours. Have a good book on hand, queue up some Netflix, or catch some shuteye. We like to prepare our cold brew overnight to avoid having the anticipation get to us. We’ve heard that other people will infuse for as short as 6 hours or as long as 24, but we think 12 is perfect. Secure the plunger on top of your French press and very gently depress until the grounds are wedged underneath. Put a coffee filter over a separate jar or jug for storage and carefully pour the coffee, allowing the filter to strain out any coffee sediment. Enjoy. The resulting java is a cold brew concentrate; we recommend adding water in at least a 1:1 ratio, or to your own taste preferences. Cold brewed coffee can be enjoyed black, with your favorite creamer or sweetener, or as part of a blended frozen coffee drink. Let us know if you’ve gotten in on this craze and how you take your cold brew here in the comments!